Marc talks about what happened on this day in history, including the day Cherokees were forced to move to Oklahoma as part of the New Echota Treaty, the day the 1946 railroad strike started, and the birthday of singer General Johnson. 1788 – South Carolina ratifies the United States Constitution as the 8th American state. 1807: The Chickasaw Treaty of July 23, 1805 is publicly proclaimed. 1838: Under the provisions of the New Echota Treaty of December 29, 1835, this the deadline for Cherokees to emigrate to the Indian Territory (present day Oklahoma). Any Cherokees still east of the Mississippi River, after today, are force to leave. Only an estimated 2,000 Cherokees have emigrated to the Indian Territory by today’s date, according to government estimates. General Winfield Scott is charged with removing the recalcitrant Cherokees. Many are forced from their homes at bayonet point. 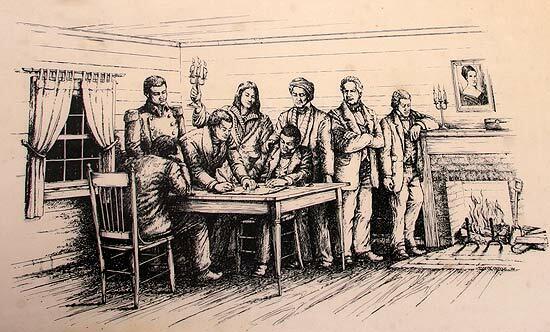 The illegal treaty is publicly proclaimed by President Jackson, two years ago, on this date. 1844 – Declaration of the Báb: a merchant of Shiraz announces that he is a Prophet and founds a religious movement that would later be brutally crushed by the Persian government. He is considered to be a forerunner of the Bahá’í Faith, and Bahá’ís celebrate the day as a holy day. 1871 – L. Bell patents Locmotive smoke stack May 23,1871 Patent# 115,153. 1878 – Atty. John Henry Smyth named minister to Liberia. 1903: An estimated 100,000 textile workers, including more than 10,000 c2014.05.19history-battle-toledohildren, strike in the Philadelphia area. Among the issues: 60-hour workweeks, including night hours, for the children. 1921 – Shuffle Along, first of a succession of popular musicals featuring Black talent, opened at the 63rd Street Music Hall, New York City. 1934 – The Auto-Lite strike culminates in the “Battle of Toledo”, a five-day melée between 1,300 troops of the Ohio National Guard and 6,000 picketers. 1946: U.S. railroad strike starts, later crushed when President Truman threatens to draft strikers. 1971: First Aboriginal Senator Chosen Neville Bonner, the Queensland President of the One People of Australia League, is certain to become the first Aboriginal member of an Australian parliament. He was selected tonight for a Senate vacancy created by Dame Annabelle Rankin becoming high commissioner to New Zealand. The state governments, by convention, accept the nominee of the party whose senator is to be replaced. Mr. Bonner wept as the Liberal Party announced the result, and said he was proud an Aborigine had finally made a breakthrough. 1983: The Granite Cutters Int’l Association of America merges with Tile, Marble, Terrazzo, Finishers & Shopmen, which five years later merged into the Carpenters. 1995 – The first version of the Java programming language is released. 2002 – The “55 parties” clause of the Kyoto Protocol is reached after its ratification by Iceland. 2013: The Boy Scouts of America’s national council voted to allow openly gay members but have not changed their ban on openly gay adult scout leaders. The move was welcomed as a step in the right direction for inclusion and tolerance. The ban had been in place for twenty-two years. 1972: Born on this day, Maxwell, US male singer, (1997 UK No.27 single ‘Sumthin’ Sumthin’ The Mantra’, 2001 US No.1 album, ‘Now’).